The CanaKit 2.5A Raspberry Pi power supply / adapter has been specially designed and tested for the Raspberry Pi 3. This power supply differs from typical standard 5V USB power supplies in the market in that it can deliver a full 2.5A and still output a voltage well within the USB minimum voltage specifications. 2.5A is now a requirement for the Raspberry Pi 3. 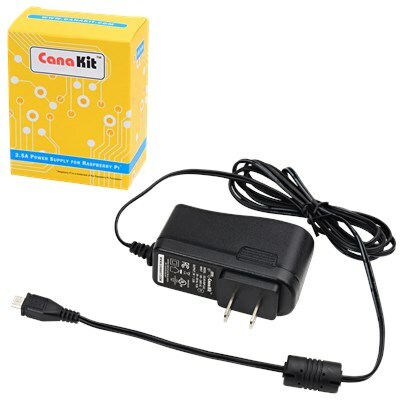 Standard 5V USB power supplies in the market have a high voltage drop when the full current is drawn from them which may cause the Raspberry Pi 3 to reboot unexpectedly. With this power supply, you can power the Raspberry Pi at full load as well as up to 1.2A across the four USB ports. The power supply still has about 0.5A of output power to spare, so even at the maximum current supported by the Raspberry Pi, the power supply is not at it's absolute maximum. It is also ideal for use by anyone over-clocking the Raspberry Pi which causes higher power requirements that a lower power adapter may not be able to supply.